Firstly, contrary to all official US pronouncements, it is beyond dispute now that the US government knew (at least from early 2012) that ‘moderate’ secular rebels were not the major force working against the Assad government. On the contrary, the US had been knowingly siding with Islamic extremists from the very beginning! Secondly, the rise of ISIS did not come as a shock to the US and take them by surprise. On the contrary, US intelligence services had predicted exactly what was going to happen some years before the storm broke. This did not affect US policy, with arms and money pouring in to support the rebel cause, even though US intelligence knew that this would all contribute to the ISIS nightmare. Perhaps the most shocking thing of all though is that nobody seems to care about these revelations! Certainly nobody in power is apologising, and the mainline media in the US is focusing on what is surely a side-issue in the declassified documents, related to the 2012 attack on the US Consulate in Benghazi. Meanwhile the Neo-cons are busy rolling out a new spin – claiming that the entire jihadist catastrophe is due to the President’s failure to give proper support to the ‘moderate Syrian rebels’ when he could have, even though it should be obvious to everyone now that these ‘moderates’ never existed! I don’t know what this says about our world. I suppose for most Americans and for most Australians this nightmare is on the other side of the world and so we don’t get too worked up about it. Eventually though the chickens come home to roost. 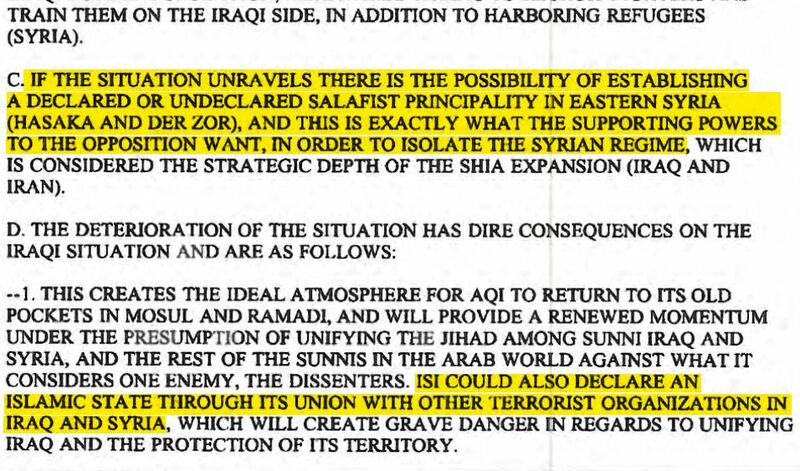 ISIS’ declaration of an Islamic State was fully anticipated two years before it happened. This entry was posted in Article and tagged DIA, Father Dave, Iraq, ISIS, syria, syrian civil war, US. Bookmark the permalink. 2 Responses to Declassified documents expose US support for ISIS and nobody cares! One of the main establishment newspapers in the U.S. is the Washington Post [as in Washington, DC, the capitol]. They just published an editorial by the head of foreign political relations for Ahrar al-Sham, a longtime al-Qaeda affiliate!! And this editorial lobbied for [can you guess?] that Ahrar al-Sham NOT be considered allied with al-Qaeda and to be considered a “moderate” rebel group and thus eligible for massive U.S. military funding! So, your reporting is a breath of fresh air. It is also very moving your descriptions of Syrian Muslims and Christians and how moderate they are and how targeted they are by groups with weapons funded by the U.S.
God bless you for your insight, Dawn. I am actually in Syria at the moment – writing from a coffee shop in Lattakia. As ever, life goes on as usual here and all the people ask us foreigners is that we stop funding the people who are trying to destroy them. It doesn’t seem to me to be a lot to ask. In terms of people in the US who could be worth making contact with, I’d encourage you to start with the ‘Syrian Solidarity Movement‘.